About 100 jugglers filled the Rastelli & Trixie studios for the 6th Annual Boulder Juggling Festival, June 18-20, 2011.One of the special things about the Boulder Juggling Festival is its association with the Boulder Circus Center, the hosting venue. This year the festival benefited from the participation of two returning professionals who trained at the BCC early in their careers. 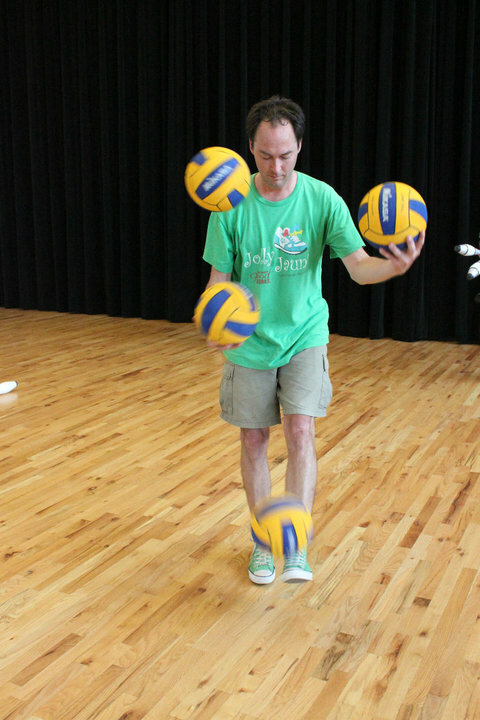 Special Guest Doug Sayers, who took coaching sessions at the BCC as a teenager and performed in the 2006 festival came full circle as he returned to lead workshops and perform as the 2009 IJA Individual Champion. Another performer with a BCC past, Cate Flaherty, won the Boulder Circus Arts Award for combining artistry and technique to create a contemporary circus act. Flaherty’s signature routine involves advanced hand-balancing and contact juggling. In a soulfully atmospheric progression of sustained artistry, acrobatics and juggling meld seamlessly. Flaherty has also trained at the Quebec circus school and did a first-rate job of hosting the BJF open stage on Friday night. Carter Brown was on hand to run Fairview Auditorium’s tech. Local favorites Bekah Smith, Warren Hammond & Ried Belstock (Smirk), Rainbow Michael of Poi Yoga Fusion, David Deeble and Cindy Marvell also performed in the Juggling & Variety Spectacular emceed by special guest Peter Panic of Boston. Highlights included Christian Kloc with incredible ball bouncing skills (he also taught), Biz the Clown with a character diabolo routine, Erin Stephens and Mark of Durango’s Salt Fire Circus with an exchange duo complete with acrobatic maneuvers and charismatic diversions, and Sam Adams Malcom of Sparkes NV, where he plans to return for 2010 IJA Fest. The Durango Jugglers announced plans to host a festival on Oct. 15, 2010. Nebraska jugglers representing “I think it rolled under the couch” also attended and performed an entertaining father-daughter act in the open stage. Bekah Smith organized games (thanks to IJA for prizes) and lead a “Floorplay” workshop. She and Marvell each performed with 4-yr-old Theo Marvell-Brown, an emerging hooper and roper, in the open stage. Home | © 1995 - 2017 Brian Dubé, Inc.